Welcome to our weekend offer for Club Gold Casino. Enjoy your time and win big! Your coupon and your deposit are in! 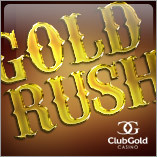 Gold Rush is LIVE at Black Diamond, Spartan Slots and Box 24! The game is from Pragmatic Play.